Theresa May is threatening to give up trying to get Brexit done any time soon unless euroskeptics in her Conservative party back down and promise to vote for her deal this week. 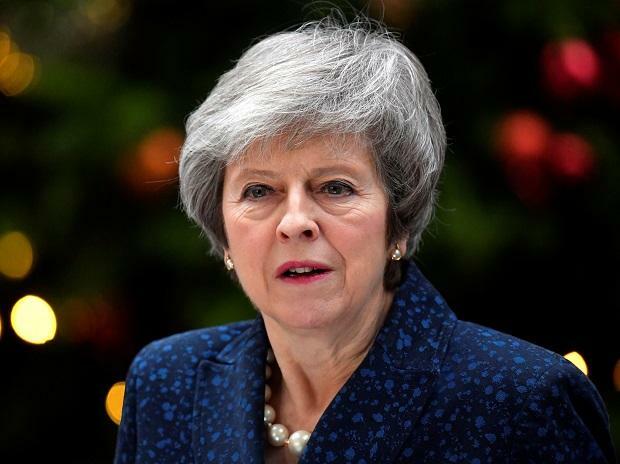 The British prime minister is still working to win support for her divorce agreement but she won’t bother putting it to another vote in Parliament as planned on Tuesday unless there is a strong chance it will be approved, ministers said. After a weekend of threats and pleading, May will continue negotiations with Northern Ireland’s Democratic Unionist Party and rebel Tory MPs on Monday, according to a person familiar with her plans. She needs both groups to switch sides if her agreement is to be passed by the House of Commons at the third attempt. Persuading enough MPs to back the deal, which has been heavily defeated twice in the House of Commons, is “a work in progress,” Chancellor of the Exchequer Philip Hammond said. May warned on Sunday that if the agreement isn’t passed before the EU summit, negotiations with the bloc might have to start over. British voters being asked to take part in May’s European Parliament elections as a result would be a “potent symbol of Parliament’s collective political failure,” she said. May’s team sees persuading the DUP’s 10 MPs to back the deal as crucial to winning over some wavering Conservative lawmakers, who have cited the backstop arrangement -- which guarantees an open border between Northern Ireland and the Irish Republic -- as a reason to oppose it. Former Northern Ireland First Minister David Trimble, a unionist -- albeit from a rival party to the DUP -- said on Monday that the latest round of negotiations in Brussels has “significantly” reduced the impact of the backstop. His intervention, in a note for the Policy Exchange think tank, might help convince Tories worried about the province’s place in the U.K. to back the deal. Hammond denied offers of extra cash for Northern Ireland were used to try to win the DUP’s support during talks on Friday, which continued through texts, emails and phone calls over the weekend. There was a blow to May’s hopes of winning over Parliament when the Brexiteer and former Foreign Secretary Boris Johnson used his column in Monday’s Telegraph newspaper to double down on his opposition to her deal and question the wisdom of a vote before EU leaders meet on Thursday. Jeremy Corbyn, leader of the Labour opposition, said his party will trigger a vote of no confidence in May and attempt to force a general election if her deal is defeated again. He also said his party’s MPs are likely to be instructed to back an amendment calling for a referendum on any deal approved by Parliament. He said he might back leaving the EU in such a plebiscite if the deal was right, setting up a clash with pro-EU members of his party.